Are You Frustrating Your Franchise Owners with How You Spend the National Ad Fund? Most franchisors have robust franchise marketing plans in place for the franchise that revolve around advertising. The marketing programs are usually mandatory and pool funds from all of the franchisees within the franchise. The national marketing plan typically includes advertising campaigns, email marketing, television and radio commercials, Internet advertising, social media around the central brand, public relations, and direct mail campaigns - all assets that aren't at the core owned local media channels. National marketing campaigns that are funded through franchisee fees are great for producing high quality marketing collateral that normally wouldn't be financially feasible for a business owner generating less than several million dollars per year in profit and they ensure brand consistency. Many times franchisees are also permitted to execute local marketing campaigns that meet the franchisors parameters and guidelines. In most cases approval from the franchisor is required prior to moving forward with the local marketing plan - creating additional overhead and requiring local marketing sophistication for the franchisee. More often than not, franchisees need to address local marketing, as the franchisor is focusing on promoting the company on a national level. Currently, well more than half of franchisees are not happy with the marketing support they receive from the franchisor. 64% of franchisees are dissatisfied with the marketing support they receive. Potbelly Sandwich Works has managed to build their marketing plan around local marketing. Potbelly offers local organizations and charities the ability to use their locations to host events, as well as a stage for local musicians. The company also does an excellent job managing their social media profiles. As you can see from the Tweet below, Potbelly is responding on behalf of the company, but is representing the Burlington, MA location. Tweets like this build loyalty. 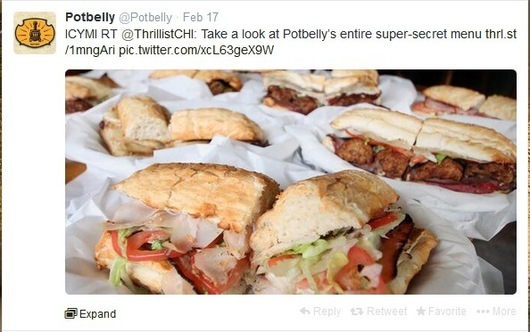 Potbelly recently retweeted a Thrilliest Chicago post that highlights their secret menu. Not only does it promote the Chicago locations, but also builds excitement around their secret menu. In summary, it's crucial to localize the marketing message wherever possible, and to empower local specific messaging at a regional or single location. A successful franchise marketing budget should allocate a portion of the budget to focus on local online marketing, and not just advertising within a region (as less than 2% of local businesses think pay per click advertising is effective). The messaging needs to be tailored to the region, while considering the area's demographics and culture, and fit into the dynamics of franchise brand control and local franchisee enablement - no small feat. For a path to a successful local franchise marketing strategy, check out our most recent franchise whitepaper, Who Owns Local Marketing? Examining the Franchisor/Franchisee Gap. The white paper explores how multi-unit enterprises and franchises can monetize local Internet marketing and how to narrow the growing gap between corporate HQ and their local retail locations. The post Successful Franchise Marketing Starts with a Local Marketing Strategy That Aligns the Franchisee with the Franchisor [Whitepaper Included] appeared first on LocalVox.